Spring is here! The trees and flowers are in full bloom and I’ve spotted the bees and hummingbirds outside working on their daily to-do list. 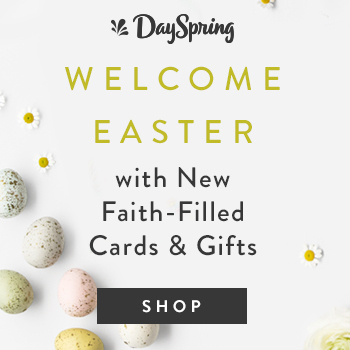 With all of God’s creation showing it’s wonderous glory, I just can’t resist a fun, spring DIY project to add to all the gorgeousness! 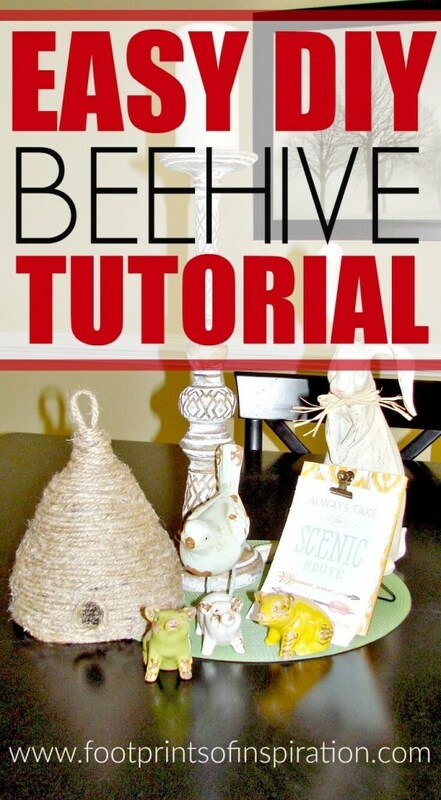 And I’ve had this Easy DIY Beehive on my to-do list for quite some time, so I’m excited to finally share it with you. 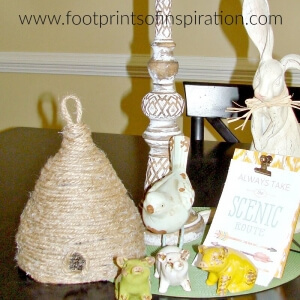 I came across this tutorial from Victoria at Confessions of a New Old Homeowner. It was such a beautiful day when I set out to make this, so I gathered up my supplies and took them out to the front porch. This is such a quick and easy DIY project and I had it completed in less than an hour. So what do you say we get started? 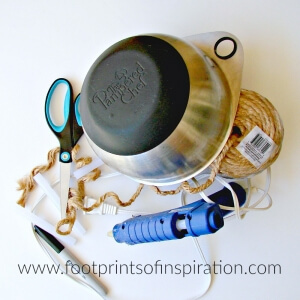 Make your first wrap around the bowl and glue together with your glue gun. 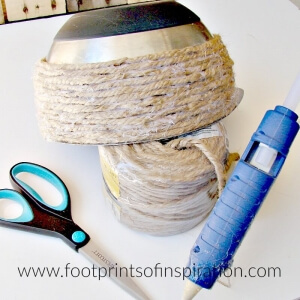 Let that set completely and then begin gluing the twine all the way around the bowl. It’s important that you make a continuous path of glue to keep the beehive nice and stable. Also, be sure to keep the twine pretty tight to help with stability. 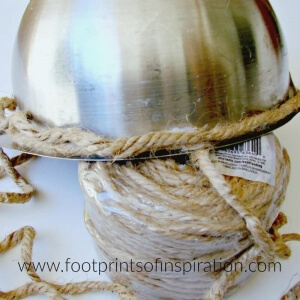 Important tip: Don’t glue the twine onto the bowl – only glue to the twine below it. Ask me how I know how important this step is! Continue this process until you’ve reached the bottom of the bowl. Begin working smaller circles that extend above the bottom of the bowl to create the top of the beehive. 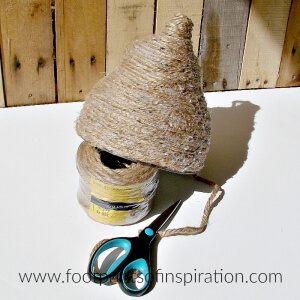 Once you’ve completed the hive, cut the twine, leaving enough to form a loop at the top. This will be completed in another step. Place your hive (still around the bowl) in the freezer for 20 minutes to set. Gently pull your hive off the bowl. 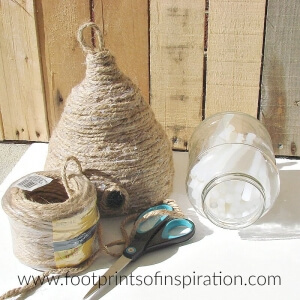 To make the “bee door,” cut a piece of twine and form a circle. Glue this onto the hive towards the bottom. Once the glue is set, color or paint the door black. Important tip: I used a sharpie marker, but I believe paint would cover it better. 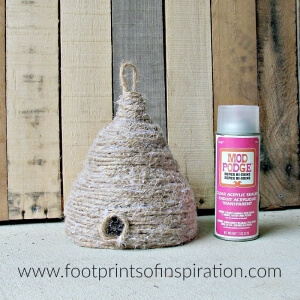 The beehive is now done, however, since I used twine instead of the jute rope, it needed a little more stability. I grabbed some Modge-Podge spray and applied several coats, allowing each coat to dry for about 15 minutes in between applications. Ta-da! Wasn’t that a fun one? You could even add a bee or two on the outside! Now go display that cuteness proudly! 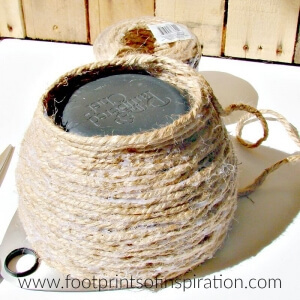 I’d use a jute rope instead of the twine. I like the look of it better and I believe it’ll make it more stable. As an extra benefit, it’ll make wrapping the bowl go a lot quicker too. I’d use paint and a foam brush to color in the “bee door” instead of the sharpie. It’ll give it better coverage. Thanks for stopping by today! Don’t forget to share your adorable creations on social media using #foidiy! P.S. Don’t miss out on a single post. Subscribe to our newsletter below and have them delivered right to your inbox. Photo cred: That adorable “Always take the scenic route” printable is from my friend, Jen at Jen T by Design! Special Note: This post may contain affiliate links. All opinions are my own. By purchasing products through these links, I may receive a small commission, however, your cost for the item does not change.